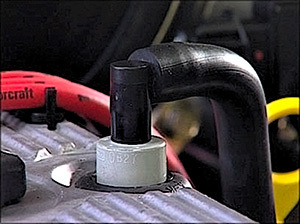 Smoke leaks through the oil level gauge, the oil is pressured into the ventilation system manifold due to increased pressure of crankcase gases. These gases literally “blow by” the piston rings. It can be the result of contamination of the crankcase ventilation system, wear of the cylinder-piston group, stuck piston rings or unpressurized valves. If the valves are not pressurized, they need to be replaced. In other cases in order to prevent accumulation of exhaust gases over the crankcase and increased pressure, you can apply certain car care products. To clean the ventilation system, add VitaFlush – oil system cleaner or Atomex TotalFlush – oil system cleaner into the motor oil (120−620 miles of run). 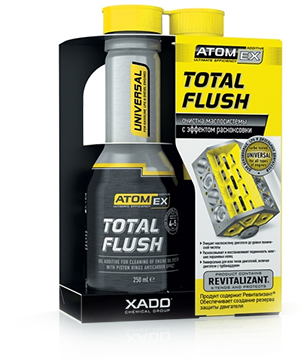 To decarbonize stuck rings, introduce Anticarbon – anti-carbon engine cleaner, MaxiFlush – fuel system cleaner, which eliminates hard-to-remove contaminations in the engine systems, into the cylinder-piston group through the plug hole.